What was your child's first word? Did it reflect his personality? One of Tyson's first words was, "uh-oh". With both of my boys, I noticed that their first words were words for immediate needs- mama, dada, juice. However, shortly after those necessary words, both boys picked up a word that they thought was "fun". I remember that Logan (who was an early talker) could say "elephant" when he was a year old.. That's certainly a fun word for a little one to say! In the same way, Tyson finds it fun to say the word "Uh-oh." He's not just enjoying the mischief he is causing when he says the word; he actually enjoys feeling his little mouth make that round "oh". 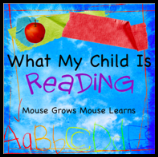 While read alouds can help introduce new vocabulary, they can also reinforce your child's growing vocabulary. Looking for a "fun" word for your child or a "known" language pattern can help develop language. I was able to find 2 cute books at the library using the phrase, "Uh-oh". It seems that Calico can't do anything right. Mommy Cat reminds her that she still loves her, even when she has a lot of "uh-ohs" in a day. Uh-oh by Rachel Isadora is an almost wordless picture book featuring a mischeivious toddler. Each page features a single word, like "diaper" followed by a picture of the toddler in his toddler environment. As the reader turns each page, he finds the toddler in some sort of mischeif in that same environment along with the toddler's signature phrase, "uh-oh!". The pictures truly tell the story and there is a lot to talk about on each page so each rereading of the book is fun! Logan (my two year old) even likes these books. Because, Rachel Isadora is becoming one of our favorite authors, I have to mention we are also reading these two books that feature that same sweet toddler and simple language. These books look lovely, and I also enjoyed the pictures. When Anna was learning to talk, she didn't say "I want..." instead she would say, "It's time to..." For example, "it's time to play". She was a born project manager :) Thanks for joining WMCIR! My oldest's first word was hello. That is such a gorgeous photo, and very uh-oh! 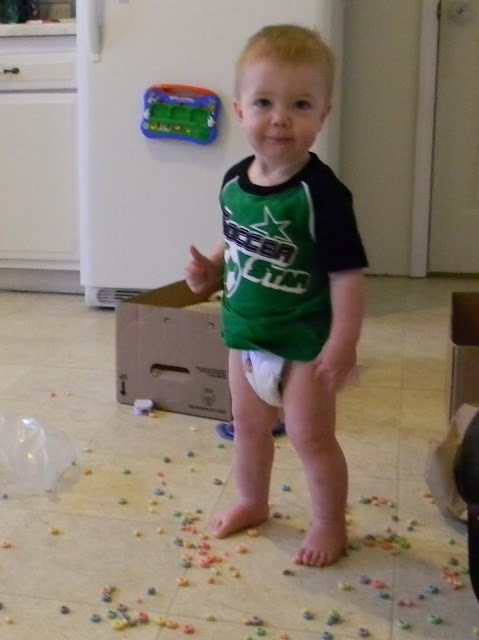 I have a cereal mischief maker photo that looks like yours. 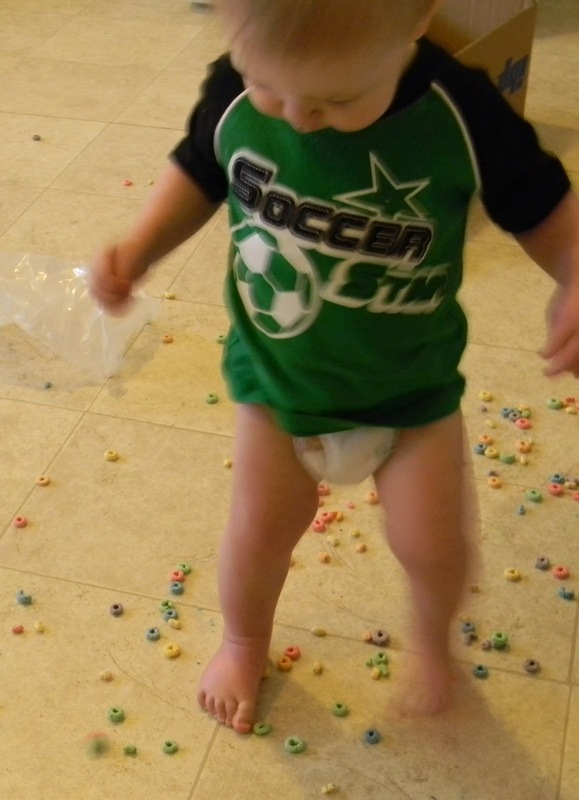 Those little ones can sure make a mess in a hurry. I wrote down my daughter's first words but wasn't as organized with my son. Poor guy.